Let's start with the story behind this photo. That shot was taken exactly ten years ago this month in the Marquesas, an isolated ring of islands twenty five miles west of Key West. And that's me holding what's left of a formerly six foot tarpon that had a run in with a much larger shark. What makes this scene really remarkable is that the dismembered fish wasn't even hooked before its demise. Even though it was the middle of June and the height of tarpon season, we were actually looking for permit that morning. I was poling my skiff close to the eastern shoreline of the islands hoping to find some tailing fish on the rising tide. My client that week was a very skilled angler who was obsessed with this notoriously difficult species and had recently created the "Ultimate Permit Fly" that he was convinced would change saltwater angling forever and make him famous in the process. We had just caught and released a small six pound permit on his "ultimate" fly (the only one he'd catch with it all week) when we both noticed a strange roostertail of water ripping between us and the mangroves. It was about fifty yards away but I could easily make out the light grey dorsal fin poking through the surface. The water was only three feet deep on this particular flat and the fin was just as tall, the unmistakable feature of a big hammerhead. This shark was clearly after something and it tore across the shallows at full throttle for about thirty seconds before we saw several fish leaping from the surface in front of it. I started poling toward the action as fast as I could just in time to witness an eruption of froth and blood and the front half of a tarpon come flying out of the water just a few boat lengths in front of us. The hammerhead kept zig-zagging around for a few more seconds, searching for the other part of its meal, and nearly collided with my boat before spooking off the flat. It was easily a twelve footer, by no means full grown but still big enough to cut a tarpon in half with one bite. I'd seen bigger hammerheads in the shallows, some as long as my seventeen foot skiff, but never one this close. Once I was convinced that the shark wasn't returning to finish its lunch we floated over and pulled what was left of the tarpon on my deck for some photos. My angler and I each took turns holding it for the camera and then slid the remains back into the water. The entire event lasted less than three minutes but to this day is still one of the most impressive things I've ever witnessed on the water. Seeing a shark eat a tarpon is not uncommon when the fish is hooked and struggling. There are scores of You Tube videos of it happening all over Florida, especially here in the Boca Grande Pass area. But the real drama of sharks chasing down free swimming tarpon is played out across the ocean thousands of times each day and so few people ever get to see it. I was extremely lucky to have a front row seat for such an amazing event. 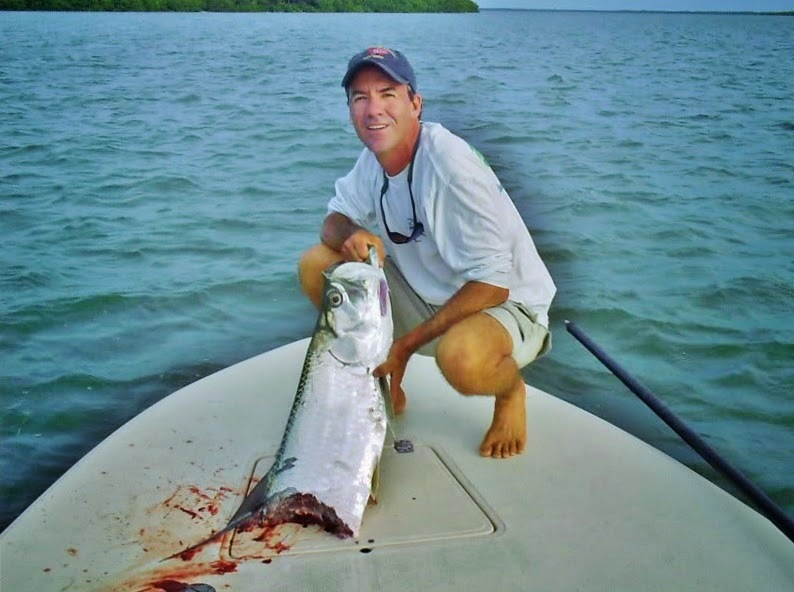 If you feel bad for the tarpon in this story and photo, you shouldn’t. They are not an endangered species and there are far more tarpon in our waters than big hammerheads. In fact, almost all shark species are in serious decline because of overfishing worldwide and the horrible practice of finning. You should really be rooting for the shark in these situations. They are way too important to the health and balance of the oceans. But this doesn’t mean that as tarpon anglers we need to sacrifice every hooked fish as soon as a shark appears. There are several things we can do to get them in quickly and release them unharmed. Using heavy tackle is a given. When I’m guiding fly fishermen for the huge beach tarpon I prefer 12-weight rods, 30# tippets, and 80# shock leaders. You can put a remarkable amount of pressure on the fish with an outfit like this and even 150 pounders can be boated in less than an hour. When I’m chasing the juveniles of Matlacha Pass I’ll still use an 8 or 9-weight rod and 20# tippet. I’m not interested in setting IGFA records, just getting them in quickly and in one piece. When I land a big tarpon after a prolonged fight the first thing I do is start the boat’s engine and slowly drag the fish through the water while holding its lower jaw. This forces water across their gills and gets their oxygen levels back to normal, while the engine noise also keeps any prowling sharks at bay. The fish will kick itself away from your grip when it’s ready but this can take several minutes in most cases. Don’t try to hurry it. Sometimes the sharks are just too quick and are on the tarpon right after they’re hooked. There are a few quick things you can do to give them a fighting chance and the first is to slam your hand on the reel to stop the drag and break the leader. Second is to make a lot of noise by banging your feet on the deck and starting the motor and revving it in neutral. This usually works surprisingly well since sharks on the flats hate human noises. Fishing is obviously never going to be a bloodless sport, even for a strict catch-and-release species like tarpon. The truth is that nearly all of them will eventually fall prey to a bigger shark. When it happens on the end of your line it’s kind of sad. But when it happens as nature intended, like it did in that photo, it’s purely amazing.